After our great experience with the Pacific Whale Foundation on the whaleatching trip, we decided to go with them on their 5 hour snorkeling trip. 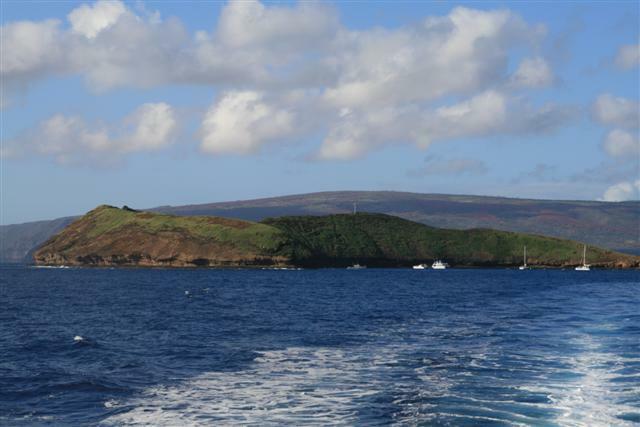 The trip started from Maalaea harbour, and checkin was at 6:15 AM – a rather ungodly hour, given that we were a good 40 minute drive from there since we were staying in Kaanapali. We were really worried about weather conditions since the harbour itself was unbelievably windy – but our fears were unfounded, as it turns out, it’s the second windiest harbour in the world, and Molokini itself was very calm. The boat was pretty full, but they managed to serve us a simple breakfast (bagels with cream cheese or a muffin, fresh fruit, and coffee/juice) very quickly. They rent out underwater digital cameras ($25 for the CD of your photos/videos) and wetsuit tops ($10). 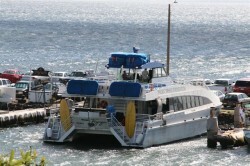 Snorkeling equipment (masks with optics, fins) is included in the price of the trip. The snorkeling at the crater itself wasn’t very good. There isn’t a lot of coral, and we only saw a few kinds of fish. We did see an eel, however. By the time we pulled anchor, all the other snorkel boats were arriving at the same spot – we were lucky to have had it almost to ourselves, and it certainly made us a little more understanding of the early morning departure. We saw a couple of dolphins as we headed to the second snorkeling spot, called Turtle Arches. We’re not sure why it’s called “Arches” – but it certainly delivered the turtles! We saw several of them in the water with us – at one point Ian had to swim backwards to avoid bumping into one that was surfacing for air. We swam above it alone for a couple of minutes, watching it feed. It was an amazing experience and our disappointment at the crater was soon forgotten. After seeing the turtles, we had a BBQ lunch on board. They served chicken and veggie burgers, as well as pasta salad. They also had open bar, but there was such a lineup at the bar that everyone stayed pretty sober. Since we still had some time, we did a little bit of whalewatching – but certainly nothing compared to what we had seen the day previous on the whalewatching trip. We would definitely recommend this trip – even if only for the turtles.